Combining a unique and striking design with fantastic all round build quality The Sabre creates a beautiful outdoor room. Manufactured by skilled craftsmen, The Sabre provides an ideal sheltered and warm environment to relax and enjoy the day. 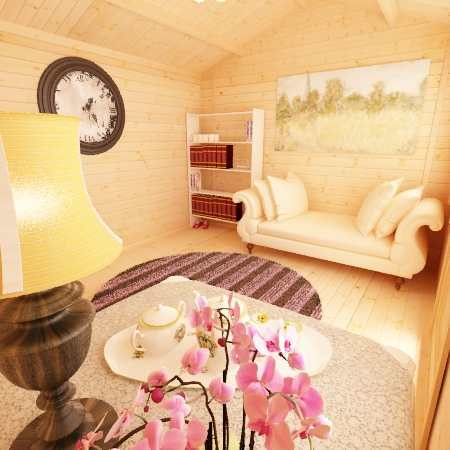 Great log cabin backed by quality customer service. 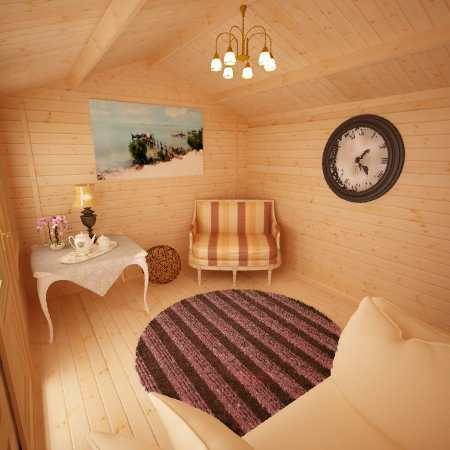 The cabin was delivered on the date specified and perfectly in the 12-2pm time slot at 12:15. The delivery man carefully placed it in our drive which was only a couple of meters from its plot. The build went up smoothly and without complication. I was a carpenter before retirement so I had a pretty good idea of what I was doing. Thanks for an easy purchase. Thank you for nice cabin and for delivery on time great stuff. Very pleased with the quality of this product, the prompt delivery and excellent customer service. I recently started my own business and therefore need some space to work so I'm going to use my cabin as a home office. Excited to only work down the bottom of my garden! A dream log cabin! I visited the showsite in Leeds and the quality of the cabins are truly amazing. I would recommend anyone to visit the show site and see for yourself before buying. The staff were very friendly and I now have the cabin and it's everything I hoped for and more. Thank you to all staff who helped me - you've made me a very happy woman! 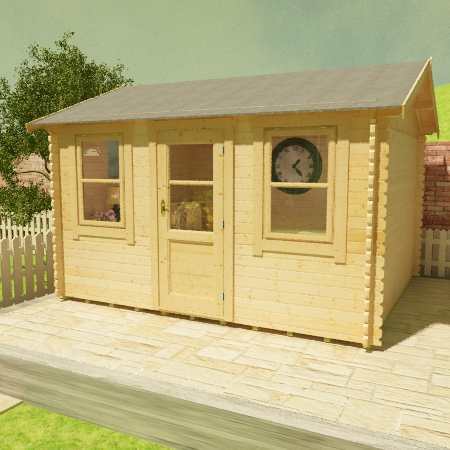 Due to recently becoming self employed I bought this log cabin to be used as an office. It took quite a long time to decide which company I wanted to go with (there are a lot to choose from!) and after a long time researching I was recommended Tiger Sheds by a family friend. What a recommendation it was!! The building looks great, it was easy to order, it's exactly how I want it, the deliver side of things looked fine. I now have my building installed and it's now filled with my desk, computer and general office supplied and I'm very happy with it. So far it's ideal for the office in terms of warmth and so I hope when winter comes round it will be just as good! I will certainly recommend Tiger Sheds just as my friend did! I had a bespoke Sabre cabin made with doors and windows moved and a pent roof added as well reducing the overall height to allow for insulating the roof. 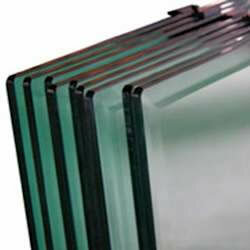 Tiger were very helpful and i recieved a quote in a couple of days. They sent me plans to help me with my foundations and base frame as i intended to insulate the floor. You need only a solid level base as there floor joists would of been sufficient. Delivery arrived bang on time and driver was very helpful. Took a day to build after insulating between the joists, drivers advice was to paint and protect after building, we did this and put two coats of solvent based colour on and it looks fantastic. Overall assembly instructions are very easy to follow, my only confusing point was the big bag of nails which i was unsure of where to use as they were not mentioned, i am assuming they were to be used to nail into the logs in the interlocks, which if this was the case then the hammer would not of fit between them. Logs fitted together well and gave a solid feel, had one with a slight twist but this went in with the rubber mallet which really is worth while having as a metal one will damage the tongues. I also choose to add 40 mm of celultex insulation to the roof then 18mm ply and underfelt and then the shingles. The shingles supplied could do with better instructions and i thought i would not have enough, however there were plenty and the finish is awesome. Now having a games room and additional insulation it will be in use all year round. Could not here it raining on the roof and during the hot spell could not feel the heat through the roof which has helped keep the temperature down. Size was 12x8, this is not internal dimensions so this is one piece of advice when choosing the size especially if you would like those inside, my only disappointment was this, as i had a plan of what was going in there and it is a bit tight now. 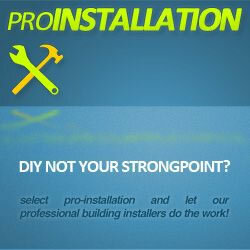 Overall fantastic product great service and a good price, best project i have done in years. Combining a unique and striking design with fantastic all round build quality The Sabre creates a beautiful outdoor room. Manufactured by skilled craftsmen using premium quality materials, The Sabre provides an ideal sheltered and warm environment to relax and enjoy the day. Strong and versatile, this amazing building can be utilised by both adults and children – it is very safe, and incredibly secure. Superior 28mm finish interlocking logs emphasise the structural integrity making it extremely stable - this model is built to last! 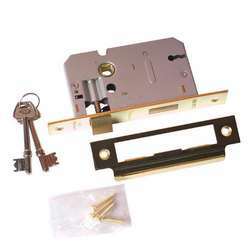 Attractive brass handles complimented with a high security 3-lever lock are included on the stylish European half glazed single door. There are two superb quality joiner made opening windows (each supplied with lock and key) at either side of the door allowing the sunlight to pour into the building and illuminate the spacious interior. With the inclusion of heavy duty green mineral roofing felt, generous roof overhang and professional draft seals fitted to all doors and windows you can rest assured that The Sabre is safely protected from the elements. 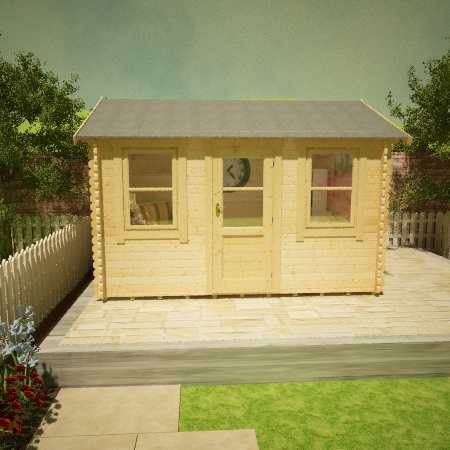 Unlike many budget competitor products, Sabre Log Cabins are built with only the highest quality materials and many log cabins in the market simply cannot compare! 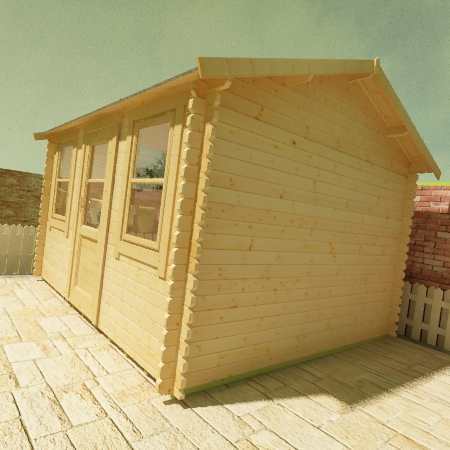 SABRE LOG CABINS feature high-grade 28mm interlocking planned and finished logs – beware of log cabins that feature rough edged boards machined from poor quality timber. SABRE LOG CABINS feature a specially designed 4-way chamfered notch-joint system ensuring a tight fit to all boards with little room for damp or wind penetration – beware of log cabins that feature square cut logs with square notch-joint, often leaving a sloppy joint with large visible gaps. 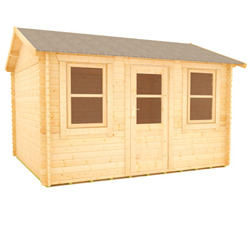 SABRE LOG CABINS feature factory fitted pressure treated weatherproof heavy duty floor joists – beware of log cabins with untreated floor joists which offer no protection against damp penetration at floor level or worse still cabins that come with no floor joists at all. SABRE LOG CABINS feature heavy duty green mineral roofing felt as standard, with the easy option to upgrade to premium quality roof shingles – beware of log cabins that come with no roof covering, leaving the log cabin completely open to the elements. 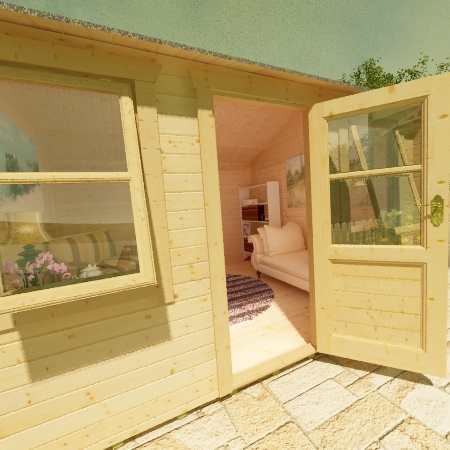 SABRE LOG CABINS feature oversized extra large doors and windows – most competitor log cabins use narrow doors which can prove difficult for access. 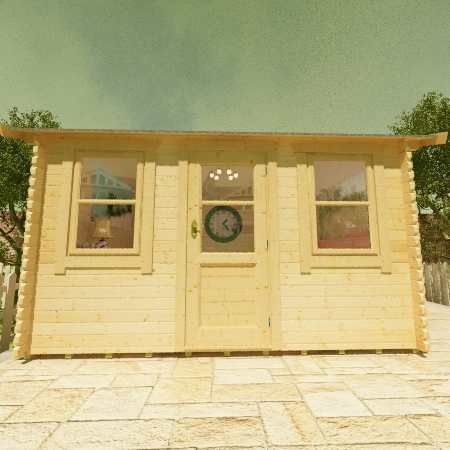 SABRE LOG CABINS feature key-lockable opening windows and all doors and windows are professionally draft sealed – beware of log cabins with cheap, ill-fitting doors and windows that cannot be properly secured and are susceptible to the weather. SABRE LOG CABINS feature high quality glazing which is factory silliconed and internally beaded to all doors and windows – beware of log cabins that feature lesser quality materials and provide no window beading. SABRE LOG CABINS feature a generous all round roof overhang which protects the building from severe conditions – beware of log cabins with little or no roof overhanging leaving them vulnerable to the wind and rain.